On the night before the knot is tied, Bachelors & Bachelorettes head out on the town to celebrate their last unwedded night and to share laughs and good times with their closest friends. The best way to go is with a large-party Bus or Stretched Limousine so that you can have all of the fun and laughs in a comfortable, luxurious and spacious ride while leaving all of the driving to us. Our Limos and large-party Limo Buses (Vans, Limo Buses) are recent model, fully loaded opulent automobiles and our drivers are experienced, knowledgeable locals who know the town and how to navigate safely. Our chauffeurs are educated, classy and discreet and are always willing to lend a hand. 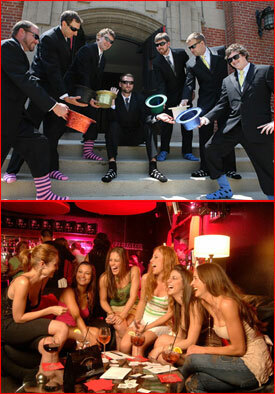 So for a safe, fun and memorable Bachelor or Bachelorette Party, call us and be driven in style. Our Limousine and large-party Limo Bus rentals are affordable (some may say cheap) and our service is top flight. In fact we come highly recommended and have more than 60 5-Star ratings on Yelp. Also be sure to see our Wedding Limousine and limo Bus Rental Services! I used Million Services for my sister's bachelorette party, for a winery tour in Napa Valley. We rented a party bus and everything was perfect! The bus was very clean and had all the amenities we needed. Champagne, bottled water and Red Bull were provided for us. Our driver was Marcus and he was the best driver ever!!! He walked us into all the wineries and made sure we knew what we were doing. As an added bonus, he was a great photographer too and never complained when we had him take pictures of our group. Reese was so great to plan with and very helpful with recommendations. I also found that they had one of the best rates in town. This was definitely one of the best experiences I had with working and renting a limo service!